The frontispiece to the 1611 first edition of the King James Bible shows the Twelve Apostles at the top. Moses and Aaron flank the central text. In the four corners sit Matthew, Mark, Luke, and John, authors of the four gospels, with their symbolic animals. The King James Version of the Bible, or Authorized Version, first published in 1611, has had a profound impact on English literature and can also be considered as historically significant, since the Non-Conformist denominations that developed within English Christianity, such as the Congregationalists, the Baptists, the Quakers and later the Methodists, shared a common assumption that all their members, lay or ordained, had easy access to the Bible in the vernacular language and the right to interpret scriptures for themselves. The more democratic governance of non-conformity had an impact on politics, as more and more people translated church governance into ideas about equal participation in civil governance. Many industrial cities would later be dominated by Non-Conformists, who translated their religious values into public service and civic responsibility to attempt to create more humane, compassionate and equal societies. The King James' Bible was a political project to assert the king's control over the established and state supported religion in Great Britain. However, once printed, this authorized version could be read by those who did not share the Church of England's dogmas, or agree with its relationship with the state or with its structures and governance. The works of famous authors such as John Milton, Herman Melville, John Dryden, and William Wordsworth are replete with inspiration derived from the King James Version. The term "King James Version (KJV)" is more commonly used in the United States, whilst the term "Authorized Version (AV)" is more commonly used in the UK, although both terms are generally understood to mean the same book. As McGrath (2002) says, the Bible changed a 'nation, a language and a culture'. The New Testament of the King James Version was translated from the Received Text (Textus Receptus), called so because most extant texts of the time were in agreement with it. The Old Testament of the King James Version is translated from the Masoretic Hebrew Text. Modern English Bibles such as the New American Standard Bible and the English Standard Version derive their authority from a completely different set of New Testament manuscripts (earlier Egyptian Minority Texts as opposed to the later Byzantine Majority Texts). King James I's dissatisfaction with the Geneva Bible's puritanism led to the creation of the King James Bible. Protestantism had the idea that the Bible was almost the sole source of doctrine (see sola scriptura) and as such should be translated into the local vernacular. The act of Bible translation into any vernacular was a political as well as a religious statement, and remained so whether the Bible translation was a private endeavor, or sponsored by a monarch and his government, though at the particular place in question secularism was not the norm. The English translations made by John Wycliffe's followers, and later by William Tyndale, were the opening salvos of the Protestant Reformation in England and Scotland. Translating the Bible into English meant defending the idea that everyone should have direct access to the word of God, and not depend on the church hierarchy for interpretation. By the time the King James Version was written, there was already a tradition going back almost a two hundred years of Bible translation into English. Many of the vernacular translations of the time were said to be filled with "heretical" translations and notes and were thus banned by the Church. The English translation of the Bible authorized by the Roman Catholic Church was the contemporary Douay-Rheims version which was a strict translation of the Latin Vulgate. The King James Bible represents a revision of Tyndale's translation. When his New Testament appeared in 1525, Tyndale used denominational labels that had meaning in 1525, in other words, a supporter of Luther's movement to reform the whole Christian community. Tyndale's translation was deliberately provocative in a number of ways; he rendered Greek presbuteros, traditionally translated as "priest," as "elder" — a literal translation that slighted the connection between the Catholic clergy and the former biblical texts; in a similar fashion he translated ekklesia, traditionally "church," as "congregation"; these renditions were at the basis of a notorious controversy between Tyndale and Sir Thomas More, who took the establishment's side. In the preface, the translators of the King James note: “we have on the one side avoided the scrupulosity of the Puritans, who leave the old Ecclesiastical words, and betake them to other, as when they put WASHING for BAPTISM, and CONGREGATION instead of CHURCH:”. Despite these controversial renderings, the merits of Tyndale's work and prose style made his translation the basis for most of the subsequent renditions into Early Modern English, although Tyndale's own life ended with being strangled and having his body burned at the stake by the Roman Catholic authorities for his alleged heresy. With these controversial translations lightly edited, Tyndale's New Testament and Pentateuch became the basis for the Great Bible, the first "authorized version" issued by the Church of England in the reign of King Henry VIII. When Mary I took the throne, she sought to re-establish Roman Catholicism as the Established Church. Some English Protestant leaders, fleeing the "fires of Smithfield" instituted by Queen Mary in co-operation with Roman Catholic policy, established an English-speaking Protestant colony at Geneva. With the help of Theodore Beza, successor to John Calvin as leader of the Reformed church there, they created the Geneva Bible. This translation, which first appeared in 1560, was a revision of Tyndale's and the Great Bible, which was furnished copiously with Protestant annotations and references. By the time Elizabeth I took the throne, the flaws of the Great Bible were apparent; those parts of it not translated by Tyndale were translated from the Latin Vulgate rather than the original languages. In 1568 the established church responded with the Bishops' Bible, but their version failed to displace the Geneva version as the most popular English version. In May 1601, King James VI of Scotland attended the General Assembly of the Church of Scotland at Saint Columba's Church in Burntisland, Fife, and proposals were put forward for a new translation of the Bible into English. Two years later, he acceded to the throne of England as King James I of England. He's therefore sometimes known as "James the Sixth and First." The King James Version was first conceived at the Hampton Court Conference, which the new king convened in January 1604, in response to the problems posed by Puritans in the Millenary Petition. According to an eyewitness account, Dr John Rainolds "moved his majesty that there might be a new translation of the Bible, because those which were allowed in the reign of king Henry the Eight and Edward the Sixth were corrupt and not answerable to the truth of the original." Rainolds offered three examples of problems with existing translations: "First, Galatians iv. 25. The Greek word susoichei is not well translated as now it is, bordereth neither expressing the force of the word, nor the apostles sense, nor the situation of the place. Secondly, psalm cv. 28, ‘They were not obedient;’ the original being, ‘They were not disobedient.’ Thirdly, psalm cvi. 30, ‘Then stood up Phinees and prayed,’ the Hebrew hath, ‘executed judgment.’"
King James proposed that a new translation be commissioned to settle the controversies; he hoped a new translation would replace the Geneva Bible and its offensive notes in the popular esteem. After the Bishop of London added a qualification that no marginal notes were to be added to Rainold’s new Bible, the king cited two passages in the Geneva translation where he found the notes offensive. King James gave the translators instructions, which were designed to discourage polemical notes, and to guarantee that the new version would conform to the ecclesiology of the Church of England. Eventually five different editions of the King James Version were produced in 1611,1629, 1638, 1762, and 1769. It is the 1769 edition which is most commonly cited as the King James Version (KJV). The ordinary Bible, read in the church, commonly called the Bishops' Bible, to be followed, and as little altered as the original will permit…. These translations to be used when they agree better with the text than the Bishops' Bible, viz. Tyndale's, Coverdale's, Matthew Bible, Whitchurch, Geneva. King James's instructions made it clear that he wanted the resulting translation to contain a minimum of controversial notes and apparatus, and that he wanted the episcopal structure of the Established Church, and traditional beliefs about an ordained clergy to be reflected in the new translation. His order directed the translators to revise the Bishop's Bible, comparing other named English versions. It is for this reason that the flyleaves of most printings of the King James Bible observe that the text had been "translated out of the original tongues, and with the former translations diligently compared and revised (by His Majesty's special command.)" At least 80 percent of the King James New Testament is unaltered from Tyndale's translation. The King James Version was translated by 47 scholars (although 54 were originally contracted) working in six committees, two based in each of the University of Oxford, the University of Cambridge, and Westminster. They worked on certain parts separately; then the drafts produced by each committee were compared and revised for harmony with each other. The scholars were not paid for their translation work, but were required to support themselves as best they could. Many were supported by the various colleges at Oxford and Cambridge. In January 1609 a General Committee of Review met at Stationers' Hall, London to review the completed manuscripts from the six companies. The committee included John Bois, Andrew Downes, John Harmer, and others known only by their initials, including "AL" (who may be Arthur Lake). Some have claimed that the playwright William Shakespeare was involved in the translation, pointing to Psalms 46 as proof, where, counting 46 words from the beginning, one comes upon the word "shake," and counting 46 words backwards from the end, one comes upon the word "spear." Additionally, Shakespeare was 46 years of age at the time of the translating. Most scholars dismiss claims of Shakespeare's involvement in translating the King James Version, and do not accept this example as evidence of his involvement. Notably, the Geneva Bible and several other earlier translations contained the same coincidence, despite several of them being published before or just shortly after Shakespeare's birth. The original printing of the King James Version was published by Robert Barker in 1611 and could be bought looseleaf for ten shillings (s), or bound for twelve. Like the earlier English translations such as Tyndale's and the Geneva Bible, the King James Version was translated from Greek and Hebrew texts, bypassing the Latin Vulgate. The King James Version's Old Testament is based on the Masoretic Text while the New Testament is based on the Textus Receptus as published by Erasmus. The King James Version is a fairly literal translation of these base sources; words implied but not actually in the original source are specially marked in most printings (either by being inside square brackets, or as italicized text). In the Old Testament, there are also a large number of differences from modern translations that are based not on manuscript differences, but on a different translation of Ancient Hebrew vocabulary or grammar by the translators. Hebrew scholarship by non-Jews was not as developed in the early seventeenth century as it is now. The New Testament is largely unaffected by this as the grasp of Koine Greek was already quite firm in the West by the time the translation was made. The difference is partially caused by the fact that while there is a very large and diverse body of extra-biblical material extant in Ancient Greek, there is very little such material in Ancient Hebrew, and probably not even this little was known to the translators at the time. Additionally, Hebrew scholarship in modern times has been much improved by information gleaned from Aramaic (Syrian) and Arabic, two Semitic languages related to Ancient Hebrew, both of which have a continuous existence as living languages. Since these languages are still in use and have larger bodies of extant material than Ancient Hebrew (especially in the case of Arabic), many Hebrew words and Hebrew grammar phenomena can now be understood in a way not available at the time the King James Version was written. The King James Version has traditionally been appreciated for the quality of the prose and poetry in the translation. However, the English language has changed since the time of publication so that it employs words and grammatical structures that may be foreign to modern readers. For example, the King James Version uses the second person singular pronouns, such as "thou." Some words used in the King James Version have changed meaning since the translation was made; for example "replenish" is used in the translation in the sense of "fill" where the modern verb means "to refill," and "even" (a word very often introduced by the translators and thus italicized) is mostly used in the sense of "namely" or "that is." Due to this, some modern readers may find the KJV more difficult to read than more recent translations (for the same reason that some find Shakespeare more difficult to read than more recent authors). At the time William Tyndale made his Bible translation, there was no consensus in Early Modern English as to whether the older pronoun his or the neologism its was the proper genitive case of the third person singular pronoun it. Tyndale dodged the difficulty by using phrases such as the blood thereof rather than choosing between his blood or its blood. By the time the King James translators wrote, usage had settled on its, but Tyndale's style was familiar and considered a part of an appropriately biblical style, and they chose to retain the old wording. Now, when the time was come that she should be deliuered, beholde, there were twinnes in her wombe. And when she was in trauell, the one put out his hand: and the midwife tooke and bound a red threde about his hand, saying, This is come out first. But when he plucked his hand backe againe, loe, his brother came out, and the midwife said, How hast thou broken the breach vpon thee? and his name was called Pharez. And afterward came out his brother that had the red threde about his hande, and his name was called Zarah. And it came to passe in the time of her trauaile, that beholde, twinnes were in her wombe. And it came to passe when she trauailed, that the one put out his hand, and the midwife tooke and bound vpon his hand a skarlet threed, saying, This came out first. And it came to passe as he drewe back his hand, that behold, his brother came out: and she said, How hast thou broken foorth? this breach bee vpon thee: Therefore his name was called Pharez. And afterward came out his brother that had the skarlet threed vpon his hand, and his name was called Zarah. Both passages owe a great deal to Tyndale's earlier rendition of this text. But the King James text repeats as it came to pass where Geneva has now or and when. Some modern readers are startled by some of the words used by the King James translators, such as piss (1 Samuel 25:22 and 34), teats (Ezekiel 23:3), menstruous woman (Lamentations 1:17), or paps (Revelation 1:13). This frankness accurately conveys the sense of the original languages without euphemism, unlike some more recent renditions such as the New International Version. Some scholars working with Greek, Aramaic, and Hebrew versions regard the KJV as an inferior English translation of the Bible, (see Dynamic equivalence) suggesting that its value lies in its poetic language at the cost of accuracy in translation, whilst other scholars would firmly disagree with these claims . While the King James Version was meant to replace the Bishops' Bible as the official version for readings in the Church of England, it apparently was never specifically mandated. It nevertheless began to replace earlier editions in the Church of England. Its acceptance by the general public took longer. The Geneva Bible continued to be quite popular, and continued to be reprinted well into the period of the English Civil War, in which soldiers of the New Model Army were issued Genevan New Testaments called "The Soldiers' Bible." One early printing of the King James Bible combines the King James translation text with the Genevan marginal notes. After the English Restoration, however, the Geneva Bible was held to be politically suspect, and a reminder of the repudiated Puritan era. The King James Bible then became the only current version circulated among English speaking people as familiarity and stylistic merits won it the respect of the populace. Current printings of the King James Bible differ from the original in several ways. 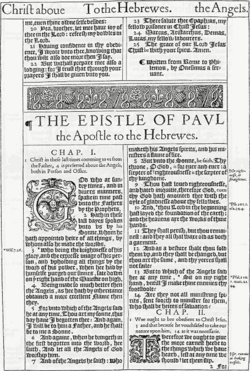 The opening of the Epistle to the Hebrews of the 1611 edition of the King James Bible shows the original typeface. Marginal notes reference variant translations and cross references to other Bible passages. The original printing of the King James Version included the Apocrypha, so named in the text. It contained all the books and sections of books present in the Latin Vulgate's Old Testament but missing in the Hebrew. Under the Thirty-Nine Articles, the doctrinal confession of the Church of England established in 1563, these books were considered non-canonical but were to be "read for example of life and instruction of manners". This section also includes apocrypha from the Vulgate's appendix. (For more information, see the article on the biblical canon.) These texts are printed separately, between the end of the Old Testament and the beginning of the New Testament. Verses unique to the Septuagint's version of the Book of Esther and the Book of Daniel (The Prayer of Azariah, Bel and the Dragon, Susanna) were placed here, rather than included in the texts of those books. From approximately 1827, many editions have omitted this section, and the most common contemporary editions rarely include them. A list of these apocrypha can be found here. The original printing also included a number of variant readings and alternative translations of some passages; most current printings omit these. (One American edition that does still print these notes is the Cornerstone UltraThin Reference Bible, published by Broadman and Holman.) The original printing also included some marginal references to indicate where one passage of Scripture quoted or directly related to another. Most current printings omit these. The second, and more interesting preface was called The Translators to the Reader, a long and learned essay that defends the undertaking of the new version. It observes that their goal was not to make a bad translation good, but a good translation better, and says that "we do not deny, nay we affirm and avow, that the very meanest translation of the Bible in English, set forth by men of our profession… containeth the word of God, nay, is the word of God." Few editions anywhere include this text. The first printing contained a number of other apparatus, including a table for the reading of the Psalms at matins and vespers, and a calendar, an almanac, and a table of holy days and observances. Much of this material has become obsolete with the adoption of the Gregorian Calendar by the UK and its colonies in 1752 and thus modern editions invariably omit it. The original printing was made before English spelling was standardized. They wrote "v" invariably for lower-case initial "u" and "v," and "u" for "u" and "v" everywhere else. They used long "ſ" for non-final "s." The letter "j" occurs only after "i" or as the final letter in a Roman numeral. Punctuation was used differently. The printers sometimes used ye for the, (replacing the Middle English thorn with the continental y) and wrote ã for an or am (in the style of scribe's shorthand) and so forth when space needed to be saved. Current printings remove most, but not all, of the variant spellings; the punctuation has also been changed, but still varies from current usage norms. The first printing used a black letter typeface instead of a Roman typeface. This contrasted with the Geneva Bible, which was the first English Bible printed in a Roman typeface. It also used Roman type instead of italics to indicate text that had been supplied by the translators, or thought needful for English grammar but which was not present in the Greek or Hebrew. The first printing used the device of using different type faces to show supplied words sparsely and inconsistently. This is perhaps the most significant difference between the original text and the current text. Even the typeface made a political and a religious statement. Like the Great Bible and the Bishops' Bible, the King James Bible was "appointed to be read in churches." It was a large folio volume meant for public use, not private devotion; the weight of the type mirrored the weight of establishment authority behind it. The Geneva Bible was always printed in Roman type, usually of the Garamond family; it was meant to be user-friendly for personal and private use. A folio Roman typeface edition of the King James Bible followed in 1614. Current printings of the King James Bible are typically based on an edition published at the University of Oxford in 1769, edited by Benjamin Blayney, and contain substantially the same text; however, there are a number of differences between the 1769 and the 1611. The Oxford edition applied the device of supplying italics for absent words much more thoroughly, corrected a number of minor errors in punctuation, and made the spelling more consistent and updated (that is, to the standards of the 18th century). However, in 2005, Cambridge University Press released its New Cambridge Paragraph Bible, edited by David Norton, which modernized the spelling much more thoroughly (that is, to present-day standards) and introduced quotation marks. The University of Cambridge is one of the very few organisations which directly hold the right to print the King James Bible, and continues to exercise this right even today; many King James Bibles hail from the printing presses of either Cambridge or Oxford, the only other university accorded this privilege. In most of the world the King James Bible is freely reproduced as if it were out of copyright. This is not the case in the United Kingdom itself. In the United Kingdom, the rights to the Authorized Version are held by the British Crown. The rights fall outside the scope of copyright as defined in statute law. Instead they fall under the purview of the Royal Prerogative and as such they are perpetual in subsistence. Publishers are licensed to reproduce the Authorized Version under letters patent. In England, Wales and Northern Ireland the letters patent are held by the Queen's Printer, and in Scotland by the Scottish Bible Board. The office of Queen's Printer has been associated with the right to reproduce the Bible for many years, with the earliest known reference coming in 1577. 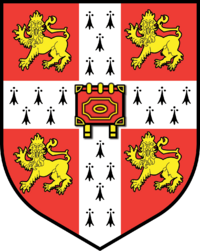 In England, Wales and Northern Ireland the Queen's Printer is Cambridge University Press. CUP inherited the right of being Queen's Printer when they took over the firm of Eyre & Spottiswoode in the late twentieth century. Eyre & Spottiswoode had been Queen's Printer since 1901. Other letters patent of similar antiquity grant Cambridge University Press and Oxford University Press the right to produce the Authorized Version independently of the Queen's Printer. In Scotland the Authorized Version is published by Collins under license from the Scottish Bible Board, but in recent years the publisher Canongate was allowed to produce a series of individual books of the Bible under the series title "The Pocket Canons." The terms of the letters patent prohibit those other than the holders, or those authorized by the holders from printing, publishing or importing the Authorized Version into the United Kingdom. The protection that the Authorized Version, and also the Book of Common Prayer, enjoy is the last remnant of the time when the Crown held a monopoly over all printing and publishing in the United Kingdom. Royal prerogative is not recognized in United States law, and therefore the KJV is effectively in the public domain in that country. The King James Version has proved to have been an influence on writers and poets, whether in their literary style, or matters of content such as the images they depicted, until the advent of modernism. Although influenced by the Bible in general, they likely could not have helped being influenced by the style of writing the King James Version used, prevalent as it was during their time. John Hayes Gardiner of Harvard University once stated that "in all study of English literature, if there be any one axiom which may be accepted without question, it is that the ultimate standard of English prose style is set by the King James version of the Bible." Compton's Encyclopedia once said that the King James Version " …has been a model of writing for generations of English-speaking people." A general effect of the King James Version was to influence writers in their model of writing; beforehand, authors generally wrote as scholars addressing an audience of other scholars, as few ordinary peasants were literate at the time. The King James Version, as it was meant for dissemination among the ordinary man and to be read by preachers to their congregations, could not afford the luxury of using such a technique. The simpler, more direct style used by the translators of the King James Version so influenced authors that their prose began to address the reader as if he or she was an ordinary person instead of a scholar, thus helping create the idea of the general reader. Nineteenth century preacher Charles Spurgeon once declared of author John Bunyan, "Read anything of his, and you will see that it is almost like reading the Bible itself." Bunyan's allegorical novel, The Pilgrim's Progress, was a cornerstone of early Protestant literature; frequently, it would be the second piece of literature translated into the vernacular by missionaries, the first being the King James Version itself — though it is noteworthy that The Pilgrim's Progress mostly quoted from the Geneva Bible. According to Thomas Macaulay, "he knew no language but the English as it was spoken by the common people; he had studied no great model of composition, with the exception of our noble translation of the Bible. But of that his knowledge was such that he might have been called a living concordance." Several more famous writers and poets have taken inspiration from the King James Version. William Wordsworth's poems such as Intimations of Immortality and Ode to Duty contained obvious references to the Bible. Poet George Byron even composed poems which required prior understanding of the Bible before one could fully comprehend them, such as Jephtha's Daughter and The Song of Saul Before his Last Battle. John Keats described "the sad heart of Ruth, / when, sick for home, She stood in tears amid the alien corn." The poetry of William Blake was also greatly influenced by the language and imagery of the King James Bible, a famous example being The Lamb from his Songs of Innocence. The language of Emily Dickinson was informed by the Bible. Mark Twain used the Book of Genesis as the basis for From Adam's Diary and From Eve's Diary. The Rise of Silas Lapham by William Dean Howells uses the image of Jacob wrestling with the angel as an important metaphor. Many poems by T. S. Eliot employ images drawn from the Bible. Ernest Hemingway titled his first novel The Sun Also Rises, after a quote from Ecclesiastes, and Flannery O'Connor drew on the gospels for the title and theme of The Violent Bear it Away. The title of Robert A. Heinlein's seminal science fiction novel Stranger in a Strange Land is a direct quote from Exodus 2:22: "And she [Zippo'rah] bare him a son, and he called his name Gershom: for he said, I have been a stranger in a strange land." The title of John Steinbeck's East of Eden comes from the Authorized Version of Genesis 4:16. ↑ John Hinton, Ph.D. Harvard University,  Ridiculous KJV Bible Corrections: Psalm 46, Shakespeare in the KJV? Retrieved November 2, 2008. ↑ Famous Quotes about the Authorized King James Version of the Bible:  holybible.com. Retrieved November 2, 2008. Cardwell, Edward. A history of conferences and other proceedings connected with the revision of the Book of common prayer: From the year 1558 to the year 1690. (original Oxford Press 1861) reprint ed. Gregg Press; 3rd edition, 1966. Daniel, David. 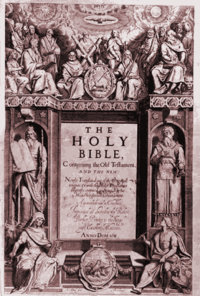 The Bible in English: Its History and Influence. New Haven, CT: Yale University Press, 2003 ISBN 0300099304. Farstad, Arthur. The New King James Version: In The Great Tradition. Nashville, TN: Nelson Reference. 2003 ISBN 0785251758. Holladay, William. Unbound by Time: Isaiah Still Speaks. Cambridge, MA: Cowley Publications, 2002 ISBN 1561012041. McAfee, Cleland Boyd (1912). The Influence of the King James Version on English Literature. Retrieved 22 November 2004. History of "King James Bible"
This page was last modified on 17 April 2018, at 14:40.